On-air challenge: Every answer this week is a phrase in the form "___ and ___." I'll give you rhymes for the two missing words. You complete the phrases. For example: Lick and lose --> pick and choose. Last week's challenge: Name a famous singer — first and last names. The last four letters of the first name spelled backward plus the first four letters of the last name spelled forward, read together, in order, name a section of products in a drugstore. What is it? Answer: Mariah Carey --> hair care. On-air challenge: Every answer today is a familiar two-word phrase or name in which the first word ends in "X" and the second starts with "C" (as in XC, the Roman numeral for 90). A friend of mine recently turned 90, and I made this as a birthday gift. For example: Tailless feline --> MANX CAT. Last week's challenge, from Sandy Weisz of Chicago: Take the name of a famous musical. Write it in upper- and lowercase letters, as you usually would. On-air challenge: Every answer this week is an anagram of a six-letter girl's name. I'll give you the name and a synonym of its anagram. You tell me the anagram. For example: GLENDA Hang loosely --> DANGLE. Take the category, then name something in it whose first two letters are the last two letters of the category's name. For example: Author > (George) Orwell. On-air challenge: Every answer is a familiar two-word phrase or name in which the first word ends in the letter -E, and the second word starts GO-. For example: Something you might say when you're about to take a plunge --> HERE GOES. Last week's challenge: Name something to eat. Change one letter in it and rearrange the result. You'll name the person who makes this food. Who is it? Winner: Mary Ann Gaeddert, of Georgetown, Ky.
On-air challenge: Change one letter of each word and rearrange the result to get a new word that can follow it, to complete a common two-word phrase. For example: FALL ... changing one of the L's to a T --> FLAT: Fall Flat. Last week's challenge, based on an idea by listener Jon Herman: If PAJAMA represents first, and REBUKE represents second, what nine-letter word can represent third? There are two possible answers, one common and one not so common. Either one will be counted correct. On-air challenge: Every answer this week is the name of an article of apparel — something to wear. Name the items from the anagram given. Last week's challenge: This was a variation on the old word-ladder puzzle. 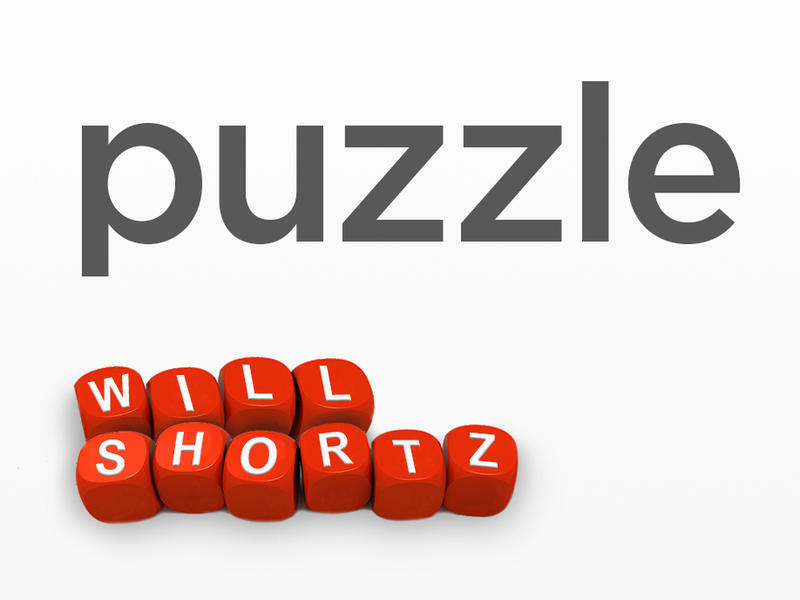 The object is to change WHOLE to HEART by either adding or subtracting one letter at a time, making a new, common, uncapitalized word at each step. On-air challenge: Three words will be given, starting with the letters F, B, and I respectively. Find a word that can follow each one to complete a compound word or a familiar two-word phrase. Last week's challenge: Name a state capital. Drop one of its letters. The remaining letters can be rearranged to name another major city in the United States. What is it? There are two different answers, and you should find both of them. I'm going to give you some 5-letter words. For each one, change the middle letter to two new letters to get a familiar 6-letter word.